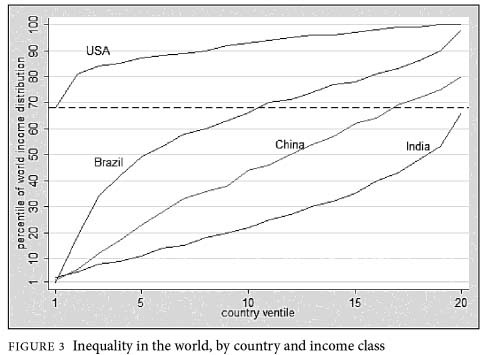 Milanovic has broken income (adjusted for purchasing power) by country down into twenty “ventiles.” So the lowest five percent of income earners are in the first ventile and the richest five percent are in the top ventile. What this piece shows is that the poorest of the poor in America are in the 70th percentile of world income. Compared with India — the average American in that first ventile has as much income (adjusted for purchasing power) as the richest Indian ventile. I also note with interest that there is a very steep ascent of the American distribution, indicating the poor here are really, really poor in relative terms, but the rest of the country is in pretty good shape. The median income in the US in comfortably in the top 10% of world income. Well, I’m pretty happy, but maybe that’s just me. In response to my post on The Spirit Level, Oscar Koberling pointed out in an email that the most recent issue (pronounce that with an “s”, not “ishue”) of The Economist includes a Special Report on “The Few” (not the proud, but the rich). One article in that Report beats up pretty effectively on The Spirit Level. Thanks for the tip! Last time we met for the Schumpeter Roundtable tutorial, we discussed Schumpeter’s point that perhaps the greatest strength of capitalism is that it provides precise, prompt, exact and effective incentives in the promise of great riches and the threat of great destitution. He would know, having been on both ends of that spectrum (well, almost). That sort of system has inequality built into it—inequality that serves an important purpose, some would say. A discussion on inequality and progress ensued, with spiritual, moral, economic, and technological dimensions, eventually leading one participant to remark that “going to Best Buy is a spiritual journey!” But there is, of course, a serious question: Is inequality good for a society (in the long run)? Or, to put it in terms of a trade-off, how much inequality is best? Tonight Tom Ashbrook on NPR spoke with UK Professors Pickett and Wilkinson, authors of The Spirit Level: Why Greater Equality Makes Societies Stronger. The book is based on research that shows, the authors claim, that more equal societies always do better in a number of ways, including overall population health. They argue that more equal societies are even more innovative, contrary to what Schumpeter might say about the importance of incentives in driving progress. As Professor Gerard has pointed out, economists do think about inequality and its consequences, and this book may add evidence to one or both sides. One member of the Schumpeter Roundtable argued that there is so much inequality in the US today, that most people are too discouraged to try hard to reach the top. This book seems to support that argument. Contrast that with Adam Smith’s view that the great driving force of economic development is the extraordinary effort of “[t]he poor man’s son, whom heaven in its anger has visited with ambition,” struggling to attain riches in the (erroneous) belief that money can buy happiness.